“Wausau PD is very proud of its K-9 program for the integral part it plays in our drug prevention and enforcement efforts. With the financial support from the Ben Roethlisberger Foundation, Wausau Police will expand the K-9 program and have a larger impact on our community. 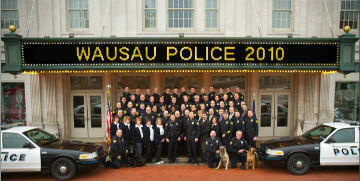 We will continue to aggressively enforce drug laws to make Wausau a great place to live and visit. We are very grateful for the generosity of the Ben Roethlisberger Foundation. Additionally, we want to thank the Community Foundation of North Central Wisconsin for being the fiscal agent of this grant.” — Wausau Police Chief Jeff Hardel. Today, Ben announced that his Foundation, in association with The Giving Back Fund, will be distributing a grant to the Wausau Police Department, approximately 90 minutes east of Green Bay where the Steelers will play the Packers on Sunday, December 22nd. The Wausau Police Department will use the grant to purchase and train a new K-9 for their unit. During the 2013-14 NFL season, the Ben Roethlisberger Foundation will be distributing grants to K-9 units of police and fire departments in the cities and surrounding communities of each regular season away game for the Steelers. The Foundation will also distribute several grants to the Pittsburgh area and will consider a grant to a non-NFL market city in the United States for each playoff game in which the Steelers compete. The Ben Roethlisberger Foundation invited police and fire departments across the country to submit proposals detailing their needs. This marks the seventh season that the Ben Roethlisberger Foundation has distributed grants to K-9 units. The mission of the Foundation is to support K-9 units of police and fire departments throughout the United States with a particular emphasis on support for service dogs in Pittsburgh, PA. Ben and the Foundation also strive to support Make-A-Wish. You can learn more about the Ben’s foundation here, and The Giving Back Fund here.